As I’ve mentioned previously in this space, I derive great pleasure from finding musical buried treasure. The release of Brian Lynch’s brilliant Unsung Heroes, has caused me to spend a bit of time thinking about and researching outstanding trumpet players who have not garnered the recognition that they deserve. The reasons for their obscurity range from bad temperament, to bad management, to just plain old bad luck. So I’ve decided to devote several blog posts to honoring a few obscure trumpet masters. Some are also lauded on Mr. Lynch’s album and some are not. Some are still working and some unfortunately, are no longer with us; but they are all worth the time and ear of the discriminating jazz fan. They will be listed in alphabetical order, one per post. Though he was a very solid technician, Coles wasn’t a flashy high note artist, which may have contributed to his relative obscurity. He only recorded four albums under his own name during his lifetime but he never lacked for work. He cut his teeth in the early ‘50’s with the R&B groups of Eddie “Cleanhead” Vinson, Earl Bostic and others. He then worked with James Moody for a couple of years, before catching on with Gil Evans in 1958, around the time the Evans/Miles Davis partnership was hitting its stride. Coles can be heard on Porgy and Bess, Sketches of Spain, and Evans masterwork Out of the Cool. Evans valued Coles in recording and in concert because his sound was very similar to that of Miles. Coles left Evans in 1964, when he was recruited by Charles Mingus, to be a part of the band for his European Tour, along with Eric Dolphy, Clifford Jordan and Jaki Byard. However, he fell ill early in the tour and had to return home, never to rejoin Mingus. He continued to work though, landing gigs over the years with Ray Charles, Duke Ellington, Mingus Dynasty and the Basie ghost band, under the leadership of Thad Jones. He made his debut as a leader, The Warm Sound, in 1961. It was a well-received quartet date with Kenny Drew, Randy Weston, Peck Morrison and Charlie Persip. His most well-known record, Little Johnny C, was recorded for Blue Note in 1964, featuring Leo Wright, Joe Henderson, Duke Pearson and other notables. He was still in fine form on his last disc as a leader, 1982’s New Morning, on Criss Cross. Johnny Coles died of cancer in 1997. 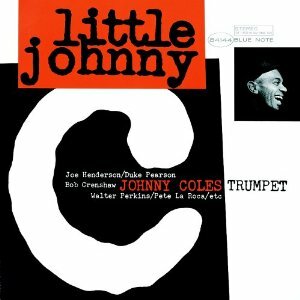 Recommended Recordings: Little Johnny C (Blue Note) – CD is OOP; mp3 version available from Amazon.com and other sources. The Warm Sound (Jazz Collectors) – CD is available as an import only; mp3 version is available from Amazon and other sources. This entry was posted on January 31, 2011 at 11:15 pm and is filed under Obscure Trumpet Masters with tags Johnny Coles; Charles Mingus; Gil Evans; Little Johnny C.	You can follow any responses to this entry through the RSS 2.0 feed. You can leave a response, or trackback from your own site. I’m a HUGE Johnny C fan! Thanks so much for shining the spotlight on this deserving player! I might also recommend Frank Morgan’s “Bebop Lives”, a live date at the Village Gate with Johnny on Flugel. Great music!!! I look forward to more in this series. How ’bout some Tommy Turrentine or Guido Basso or Tomasz Stanko??? so I have heard the man play, but did not know of him. Thinking about checking out his first recording, the one with Randy Weston. Man that is some good stuff! Too bad he didn’t stay long with Mingus. Adding this one to my wishlist! The only one I was waiting for was Dupree Bolton. Hi Clinton. Thanks for reading. The list is far from exhaustive. Dupree Bolton is a fine player. Maybe we’ll add him to “Part 2”. Johnny Coles’ solo on Sunken Treasure on Gil Evans’ Out of the Cool. Don’t need much more than that.